For wedding pricing, please fill out an inquiry on my contact page. How do I book your makeup services for my wedding date? Your wedding date becomes reserved once I receive a 30% deposit & signed contract. All booking is first come, first serve. *Please note: With the upcoming wedding season, my availability fills up quickly, so early booking is highly recommended. Why do you recommend a makeup trial? The trial is a "preview" and consultation of your wedding day makeup. I strongly suggest the makeup trial for all interested brides as each bride is different and every wedding is unique! I ask in advance for you to send me makeup inspiration pics and a selfie. This way we can collaborate together as I cater your beauty vision to your facial features. I also encourage your feedback and any adjustments you'd like me to make while you watch me do your makeup. I want to make sure you feel 100% comfortable and happy with your bridal makeup! At the end of the session, I take detailed notes on what I used on you so we can replicate your look for your wedding day! How can I plan for my makeup trial? I host makeup trials on weekdays at my in-home studio in Santa Rosa, but also offer on-site services for engagement shoots (additional travel fee). 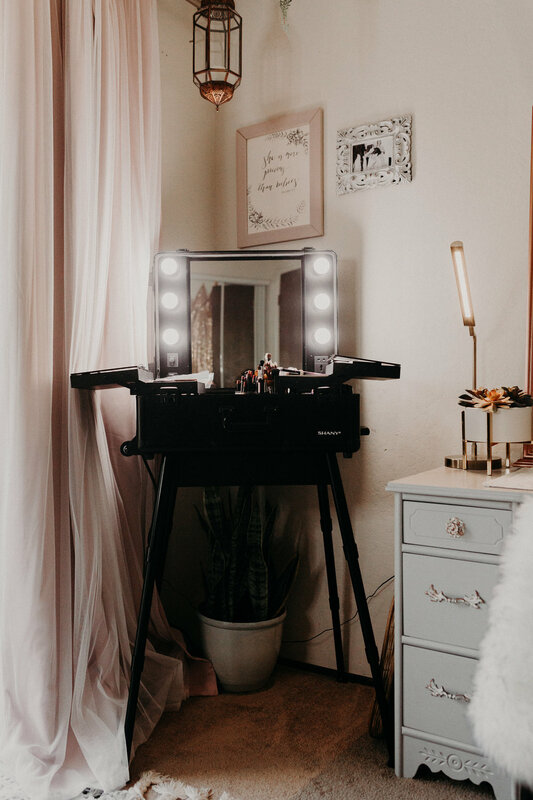 The trial generally takes anywhere between 1.5-2 hours depending on what you'd like to discuss for your bridal beauty vision, logistics, and the makeup look you desire. For helpful steps to prep for your trial, see my makeup-prep page . *Please note: your makeup trial does not ensure reservation of your wedding date. How should I plan my wedding day timeline for the makeup? For the wedding day timeline, I generally ask for 45 min/person and 1 hr for the bride. I find that 1 hour windows makes the most relaxed time frame for my brides! The start time depends on what time you need to be ready by, which tends to be coordinated between the bride and the photographer. I usually count backwards from your "ready by" time and that determines your start time. On the morning of, I plan to arrive 20-30 min before start time to settle in, setup my station, and begin the beautifying! Do you beautify large wedding parties on your own? Or is there another makeup artist you bring along? Yes & yes! I have a 3 person min requirement, so I can do as many ladies as you'd like on my own! Depending on your total headcount and timeline, (for parties of 7 or more) I offer the option of contracting one of my select makeup artists to help with the flow of the morning (additional fee). If you would like me to contract an additional artist, please let me know so I can get their availability for your wedding day! I contract the MUA(s) when I receive the deposit to book the wedding date. I am very selective of my MUAs as I only want the best for my brides, so if they are already booked I would kindly ask for you to hire your own additional artist to help, if needed. For my makeup services, I provide traditional techniques which incorporate high-end products for amazing coverage and color ranges from the beloved High-Definition RCMA foundation- famously used on celebrities, photography, & film. RCMA foundation achieves a similar light & glowing look to airbrush, high-definition finish, with healthier ingredients and guaranteed stay power for a long wedding day. I finish with high power setting spray to seal the makeup for all evening wear as well! Honestly my brides have been continuously pleased with the look and longevity of my traditional makeup application (even through the heat and the dance sweat! ), I haven't had a reason to switch or add on that service yet! What are some of the types of brands you use? On top of RCMA, I use my favorite products from various high-end makeup brands including (and not limited to): Hourglass, Nars, Anastasia Beverly Hills, Tarte, MAC, Bare Minerals, Make Up Forever, Cover FX, Becca, Urban Decay...the list goes on and on! I tailor my services and products to meet the needs of each individual client, as each bride is unique! However, if there is a specific makeup product you'd like incorporated into your bridal makeup, feel free to bring it! Do you have expertise in applying makeup on women of color? I am very in touch with catering makeup styles to different ethnic features as I myself am Asian and can totally relate! Growing up in the melting pot of the SF Bay Area, I've been working with clients of ethnicities all over the world, and specialize in custom-blended makeup to match any skin tone: pink or olive, light or deep. I'm passionate about enhancing beauty of all shades and features! Eyes and skin are incredibly important when it comes to catering ethnic facial features correctly, and I love it! Feel free to check out my range on the "Transformations" page on my website! Do you provide faux lashes? YES!! I provide complimentary strip/individual lashes with every makeup service as I highly recommend some kind of lash enhancements for beautiful and stunning photos!! Even the most natural look is enhanced with the addition of faux lashes. Every client I have converted to lashes was so happy with the results! My passion & specialty is wedding makeup, but I do have some awesome hairstylists I can refer you to!